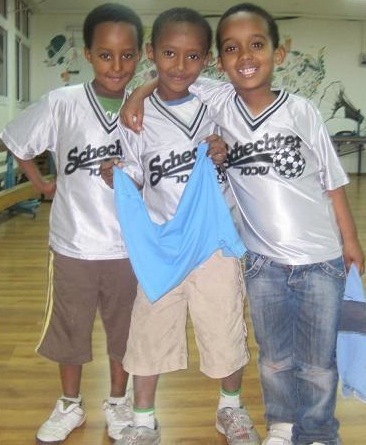 The Schechter soccer program has been going on for more years than I know. 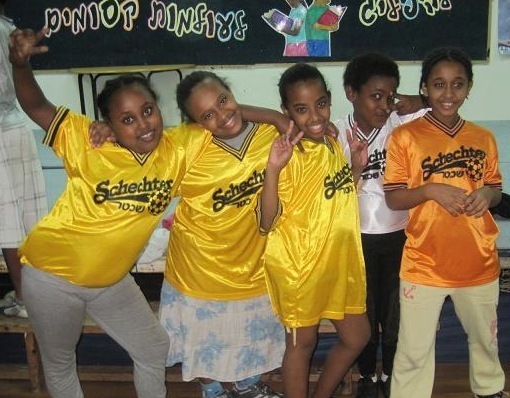 It is a Sunday soccer program meant to allow the kids at Schechter to be able to play soccer without playing on Shabbat. The program is for kids in grades K-6, and on average, we have anywhere from 100-150 kids playing in the fall session and again in the spring session. It’s a volunteer-run program, as the parents are the coaches, and there are a few of us that help run the program from an administrative perspective. We keep our expenses as low as possible to encourage as many kids to play as possible. A few years ago, at the suggestion of one of the parents who was tired of having a drawer full of old soccer shirts that his kids outgrew, we started a shirt-recycling program. It was a hit with the families, resulting in about an 80% recycling rate. This helped us keep our costs down. For a variety of reasons, we wound up with a huge surplus of 200 t-shirts for our Fall 2010 session. In an effort to keep them from taking up space in people’s garages, I looked into how we could donate them. 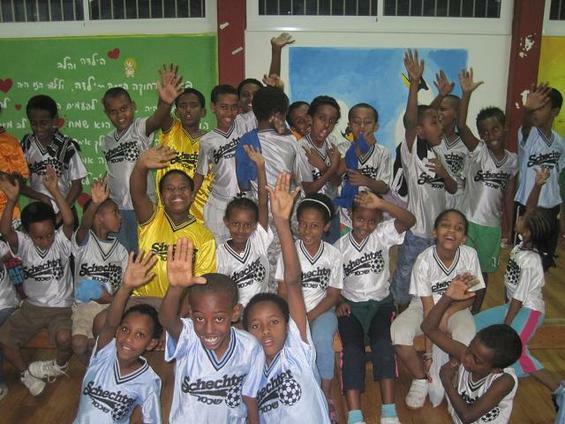 I had heard there were some Ethiopian Israeli children in Haifa who would love a special gift from a Boston partner school, so I called the only place I could think of that might help me and that was CJP. A few emails later, and I was able do deliver the shirts to CJP, and the rest was handled by CJP and the Boston-Haifa Connection, and as you can see below, the shirts are now proudly worn by students at the Gavrieli school in Haifa. Although I was able to facilitate the donation, it would not have happened without our kids. They were more than willing to return their shirts at the end of the season. I guess knowing that they would get another shirt at the start of the next season gave them a good reason to not feel like they had to keep all their shirts. But seeing the shirts being worn in Israel has just added to the special-ness of it. This is my last year of involvement in Schechter Soccer, as my son is no longer playing, so I could not think of a better way to leave the program.